Recognizing the importance of consistently implementing persistent identifiers (PIDs), a group of librarians at Cornell University evaluated several PID strategies and chose to use the Handle System. As a member of that group, the author immediately perceived cultural and technical challenges to adopting handles that included accommodating diverse computing platforms. In this article the development of cross platform Web Services and corresponding client libraries are explored as a way to address these challenges and create new opportunities for future development and maintenance of digital collections. Existing methods for identifying resources are ephemeral because these methods typically facilitate access by locating those resources within their specific delivery mechanisms. Uniform Resource Identifiers (URIs) provide a familiar example of such identifiers; however, URIs break as resources change location, as underlying delivery methods change, or as resources simply disappear. persistent, that is, each PID always identifies the same resource, even when that resource ceases to exist or is no longer accessible. In the past, Cornell University Library (CUL) has implemented Persistent Uniform Resource Locators (PURLs) for its electronic resources, and handles within DSpace, but even more often, no PID approach has been implemented in new systems. As a result, several librarians within CUL have advocated for a more consistently implemented PID strategy, primarily to support the creation and preservation of digital collections. This advocacy culminated in the creation of a working group in the first quarter 2006 charged with recommending a PID strategy for CUL going forward, with immediate application to several digital repository and preservation systems then being developed. The author was one of the librarians who participated in this working group. In addition to reviewing general identifier strategies and issues, as well as potential intersections between PIDs and other standards such as OpenURLs, and the Open Archives Initiative Protocol for Metadata Harvesting (OAI-PMH), the PID working group at CUL compared and contrasted PURLs, Archival Resource Keys (ARKs) and the Handle System among other approaches. The group ultimately recommended the Handle System based on factors that included its maturity and installed base, its fit for CUL's projects, and the existing knowledge of this approach within CUL. Soon after this preliminary recommendation was made, a local handle server was installed to further evaluate the technical and organizational requirements for implementing and maintaining handles, as well as to determine how to integrate handles into CUL's digital collection development lifecycle. Not the least of the author's concerns during this process was the cultural impact of adopting handles as an architectural best practice within CUL, which had the potential to add significant new requirements to projects already on aggressive schedules. Believing that an adoption strategy of advocacy and encouragement rather than one of stipulation and enforcement is more likely to be successful, the author endeavored to make administering handles as painless as possible for the developers who would be impacted by the decision. However, this goal has been complicated by the fact that CUL maintains systems built on multiple architectural stacks and will surely continue to adopt new technologies into the future. Once the initial CUL handle server installation was complete, the author began to integrate handles into a pilot preservation system using the Handle.net Software Client Library's (HCL) application programming interface (API) . But the HCL API was implemented at a lower level than had been anticipated; power and flexibility in the API were purchased at the expense of ease of use for developers. The HCL API also assumes the Handle System will be accessed in a Java-based environment, or at least an environment that can integrate Java components. Although typically methods exist for one programming environment to communicate with another, these methods are often inefficient and architecturally fragile. Because CUL has legacy systems written in languages other than Java that may need to incorporate handles, and because the architectures of future systems cannot be predicted with certainty (including the Handle System itself), interacting with the Handle System using a standard protocol equally accessible to all environments, independent of the Handle System implementation, is ideal. A client supplies a URI and receives the corresponding handle (PID creation). A client supplies an existing handle and receives its corresponding URI (PID resolution). A client supplies an existing handle and a URI, and receives a confirmation of its update (PID modification). A client supplies an existing handle and receives confirmation of its removal (PID deletion). Using the bundled HCL command line interface (CLI) source code as a guide, the author developed these four use cases as Web Services that enable client software on any platform to communicate with the local handle server by sending and receiving standard XML messages. The CLI source devotes a significant block of complex Java code to manipulating passwords as well as public and private key pairs to authenticate handle server requests. So, the author first factored out the authentication code, both to minimize the redundancy of the API calls across the Web Services and also to abstract those API calls behind interfaces to reduce their complexity. This code eventually became the base class from which each of the classes implementing the CRUD services inherits. The author employed standard Java tools for refactoring (that is, making changes to the design of the code without changing its underlying behavior), along with a Test Driven Development (TDD) approach, to transform the CLI source into four distinct CRUD classes, each re-using the base authentication code. The author then used the open source Apache Axis Web Services toolkit  to transform these otherwise normal classes into full-fledged Web Services that use Simple Object Access Protocol (SOAP) for XML messaging. These Web Services could then be deployed inside a standard Apache Tomcat servlet container  and made available on the Web. Finally, the author had to decide how to authenticate the Web Services themselves. The Handle System authentication was now hidden behind the Web Services, and while these authentication mechanisms still police the interaction between the Web Services and the local CUL handle server without further development, the Web Services themselves would be exposed to anonymous access. For expediency and ease of use, the author implemented a simple Internet Protocol (IP) address-based authentication mechanism to allow code running on trusted machines to access the Web Services. For each Web Service request that results in a change on the local handle server (encompassing all requests except for PID resolution), the IP address of the incoming request is matched against a file listing valid IP addresses. The originating IP address is automatically part of the HTTP request of each XML message sent from a client to the Web Services, so this approach imposes no additional burden on the client. The author implemented this IP-address-based authentication as a software aspect, utilizing the AspectJ compiler  in Java. Authentication is a system-level concern, that is, it satisfies a computing goal instead of a goal of the problem domain that the software is trying to solve  in this case, administering handles. Therefore, IP-address-based authentication is implemented separately  coded as an aspect automatically applied at compile time to the three Web Services that can result in a state change within the local CUL handle server  without directly injecting that authentication code into the source code for those Web Services. Likewise, the functionality to log exceptions or errors that can arise from the use of these Web Services is also implemented as an aspect. Exceptions are sent back to the client in the SOAP response so the client software can decide the appropriate action to take. 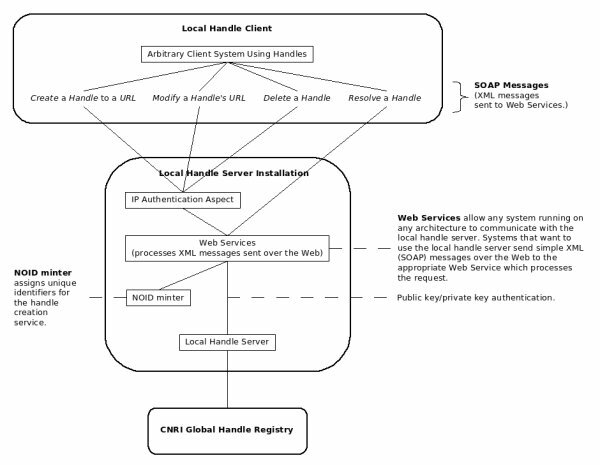 Figure 1 provides a high level overview of the handle Web Services design that exposes these simple, platform independent interfaces to the local CUL handle server. The server-specific details of both the handle server installation and the NOID minter are kept in a configuration file that is loaded by the base Web Service class used for each service. Therefore, by appropriately modifying six entries in this configuration file, these Web Services can easily be redeployed on another CUL server, or at another institution that uses handles. Finally, the author began creating client libraries for these Web Services that can be used to administer handles in other programming environments easily, without requiring the systems that use these clients to know about the Web Services or to even know about the handle server itself. Currently, Java and Perl clients exist, Python clients are being developed, and PHP and Ruby clients are planned. As a result, the background network communication with the Web Services and the subsequent communication with the local CUL handle server are transparent to clients using these libraries. The author is committed to creating these client libraries to encourage the adoption of PIDs within CUL. The author is most immediately exploring the consequences of implementing the IP-address-based authentication aspect to determine whether a finer-grained authentication mechanism is desirable. By trusting traffic from individual IP addresses, multiple clients from any given IP address are effectively indistinguishable, and all clients from valid IP addresses have the same rights to the handle Web Services so that, for example, a client could theoretically modify or even delete a handle that was created by another client on the same machine. Thus, while IP address authentication removes a significant burden of complexity from the clients, it may also add a burden of institutional responsibility. Some of these security concerns can be addressed by implementing, say, a separate, secure password strategy. Most obviously, the Web Services could then enforce policies such that, for example, only the creator of a particular handle can modify or delete that handle. Such an authentication strategy and enforcement of policies will add complexity to both the implementation of the Web Services and the client code that accesses them, however, and if this strategy were implemented, the author would endeavor to continue hiding as much of this complexity as possible behind friendlier interfaces. Additionally, policies to address the issues of scale inherent in managing client accounts would also be necessary. Other obvious improvements suggest themselves, such as further generalizing implementation details, and the author has already designed the services with such generalization in mind. For example, a unique identifier interface could be created to abstract this functionality away from the current NOID minter approach so that future implementations could generate identifiers from, say, a MySQL database table, without affecting the Web Services themselves that use the generalized interface. Furthermore, this unique identifier interface would likely become its own Web Service, independent of those used to administer handles, which would allow multiple instances of those handle Web Services to be deployed in organizations with multiple local handle server implementations, while still ensuring the creation of institutionally unique identifiers through a discrete, localized mechanism. Because of the Web-Services-based approach, a similar generalization strategy can be employed for the Handle System software itself, so that if in the future, CUL begins using a new PID approach  or even if a new backward incompatible version of the Handle System software is deployed  the new PID approach can be implemented behind the same Web Services and transparently become the new preferred PID implementation. Clients of the Web Services would not be required to make any adjustment to such changes, and in fact, the author believes that multiple PID implementations could co-exist simultaneously and transparently behind these Web Services. For example, a client can still administer existing handles while transparently administering newly implemented ARKs, or legacy PURLs, using the same Web Services. The client interfaces would be both backward and forward compatible because those clients have no knowledge of the PID implementation underlying the Web Services. Obviously, an assumption underlying this strategy is that the clients determine to what type of resources PIDs should be assigned. Finally, the author has considered that there may be metadata about the resources for which PIDs are assigned that would be both natural and convenient to administer along with the PIDs themselves. For example, it might be helpful, particularly in a preservation context, to not only resolve a PID to a resource's URI, but also to receive the anticipated checksum for that resource, if applicable, so that after the resource is retrieved, a basic check of its integrity can be performed. More use cases might be imagined for other types of metadata. Associating such metadata with PIDs is really not so different from what PIDs are meant to do in the first place. The value of a given PID is that to the client, it is a reliable method of indirection to a resource's current URI. But that URI is only an attribute of that resource, and that attribute is both arbitrary and ephemeral  which is after all why we prefer PIDs. If the PID strategy stores and retrieves URI metadata for the purpose of accessing the resource, then it may be reasonable to store and retrieve other metadata about the resource alongside its URI to further aid this process, especially when, in the case of a checksum, that metadata is much more closely representative of the resource than is the URI. A closely related idea is to expand the semantics of what a PID is ultimately referencing. For example, ARKs allow one to optionally resolve a PID to its corresponding digital object data, to the digital object's metadata, or to a commitment statement concerning the digital object, and what the author envisions may look similar to this approach while remaining independent of specific PID implementations. Or, one might simply want to store multiple URI's with a PID to locate different copies of the same resource, such as an access copy and an archival copy of an image. The Handle System itself is designed with the ability to store arbitrary data in custom fields in a handle record on the server, and while this ability could accommodate these imagined use cases, storing metadata in this way creates an obvious tight coupling between that metadata and the Handle System. Put another way, in one of the above examples, the goal is to associate a checksum with a PID, not with a handle, which is just a particular PID application. Instead, this metadata, keyed to whatever PID has been assigned, can be stored independently of any particular PID implementation and can be accessed transparently behind the PID Web Services, even if multiple PID implementations are deployed simultaneously. For example, this metadata could be expressed as Resource Description Framework (RDF) triples that are stored and queried using existing RDF software that is integrated into the PID Web Services. The need for policies and best practices for the form and content of this metadata as well as its maintenance will quickly present itself, but if these challenges can be addressed, it is the author's belief that this collection of Web Services, which easily allows present and future architectures to reliably access resources and corresponding metadata, could form the basis of new and exciting library services based on the resource or digital object as the level of granularity instead of the current collection-level view of assets often employed at institutions like CUL. This paradigm shift could not only change how we build new library services, but it could add value to existing collection-based systems as well. The author is not the first to envision and implement a Web Services interface to the Handle System. For example, in his talk entitled "A DSpace-based Preservation Repository Design" presented at the Digital Library Federation 2006 Fall Forum, Joseph Pawletko from New York University spoke of using XML-RPC to communicate with a handle server. CNRI itself has also begun work on their own Web Services for administering handles (email message from Giridhar Manepalli to handle-info@cnri.reston.va.us on November 16, 2006), and Linkstorm Corporation has begun work on a REST-based approach to do the same (email message from Mark Donoghue to handle-info@cnri.reston.va.us on November 16, 2006). Others on the Handle Info mailing list have proposed creating a working group of those who have implemented, or would like to implement, Web Services for the Handle System, to discuss existing implementations, goals and best practices. Despite the level of interest in Handle System Web Services in general, and the existing private implementations at other institutions, the author developed a core set of Web Services and corresponding client libraries to meet the immediate needs of several ongoing CUL projects and to facilitate the adoption of the Handle System within CUL. As a result, several CUL projects are actively using the Handle System through these Web Services, including CUL's Large Scale Digitization Initiative with Microsoft Corporation. The lessons learned from the development of these handle services at CUL have been, and will continue to be, added to the larger Handle System Web Services discussion. To that end, the author has obtained permission from Cornell University to freely distribute all the code discussed in this article, which is possible because the HCL is licensed under a custom agreement similar to the open source BSD license and allows for the creation and subsequent distribution of derivative works based on the HCL source. (Corporation for National Research Initiatives, "HANDLE.NET® SOFTWARE CLIENT LIBRARY (ver. 6) -- Java Version", <http://hdl.handle.net/4263537/5024>, accessed May 18,2007.) A Web site  was launched in Summer 2007 to make this code available and provide community based support and documentation. 1. HANDLE.NET Software Client Libraries <http://www.handle.net/client_download.html>. 2. Noid (Nice Opaque Identifier) Minting and Binding Tool <http://www.cdlib.org/inside/diglib/ark/noid.pdf>. 6. The Australian Persistent Identifiers Linking Infrastructure (PILIN) project <http://www.arrow.edu.au/PILIN.php>.